Prior versions: Oct 2013, June 2013. 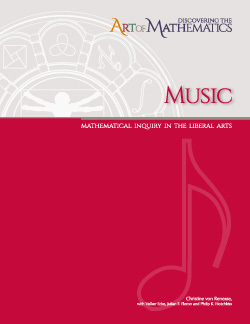 The learning guide “Discovering the Art of Mathematics: Music” lets you, the explorer, investigate connections between mathematical ideas and concepts and musical ideas and patterns. Rhythms and palindromes will lead you into combinatorial reasoning, and you will play with topological ideas while visualizing chords. You will come to understand Pythagorean tuning and how it relates to the tuning of instruments we use today. The mathematical idea of fractals will lead you to compose your own fractal music. The investigations require neither a strong background in math, nor any knowledge about music theory.